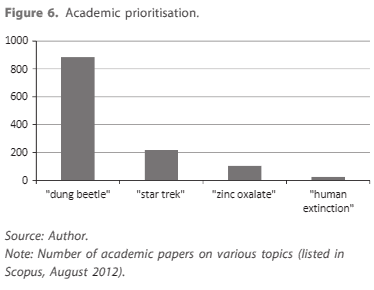 Are there more papers on dung beetles than human extinction? Do search term num­bers mat­ter? Sum­mary: Yes. But ex­tinc­tion can prob­a­bly catch up if we put our minds to it. “There are more aca­demic pa­pers on dung bee­tles than the fate of H. sapi­ens,” Sand­berg writes. That’s a bizarre state of af­fairs. What’s go­ing on? Miti­gat­ing risks re­quires more care­ful and thought­ful de­vel­op­ment of new tech­nol­ogy, mea­sures to avoid de­ploy­ment of un­safe sys­tems, and in­ter­na­tional co­or­di­na­tion to en­force agree­ments that re­duce risk. All of those are up­hill bat­tles. No won­der it’s more re­ward­ing to study dung bee­tles. I’m of­ten sus­pi­cious of claims about the state of the world (e.g. the re­sources de­voted to differ­ent aca­demic sub­jects) based on im­perfect sig­nals about the state of the world (e.g. search re­sults for pa­per top­ics). “A Google search for X re­turns Y re­sults” is a lazy cliche, al­most to­tally un­in­for­ma­tive in most places I’ve seen it used. “Google auto-com­pletes X with Y” isn’t much bet­ter. I’m too lazy to reg­ister for Sco­pus right now, but Google Scholar gives me similar re­sults for 2012. For the rest of this post, I’ll use “since 2018” as my base year, rather than 2012 -- with EA’s in­fluence, maybe X-risk is catch­ing up to bee­tles? Data col­lected on 4 Fe­bru­ary, 2019. Okay, the bee­tles are win­ning. What if I add a some of the nat­u­ral threats to hu­man­ity men­tioned by Sand­berg and Piper? Is this a de­ci­sive vic­tory? A “dung deal”, as it were? I tried re­mov­ing “global” from “global catas­trophic risk” and al­most beat the bee­tles, but I dis­cov­ered that “catas­trophic risk” is in­surance lingo which usu­ally refers to hur­ri­canes and droughts and other non-global haz­ards. I tried adding “mass ex­tinc­tion” and more than dou­bled the bee­tles’ score, but nearly all pa­pers us­ing that term are about nat­u­ral his­tory rather than fu­ture risk. I tried re­mov­ing “in­clude cita­tions?” for my searches. This cut down on bee­tle num­bers (from 1830 to 1080) and didn’t re­ally af­fect my longest X-risk search term. Sud­denly, risk came out ahead! The psy­chol­ogy con­cept of “hu­man ex­tinc­tion learn­ing”. “Hu­man ex­tinc­tion of” other an­i­mals (the real X-risk was in­side us all along). Ran­dom physics pa­pers sum­moned by my reck­less use of gamma rays. ...and so on. Take out all of that, and the bee­tles are still push­ing us around. More peo­ple are cur­rently be­ing paid to study biolog­i­cal top­ics to which dung bee­tles are rele­vant than to study hu­man ex­tinc­tion. It’s eas­ier to pub­lish pa­pers about said top­ics than about hu­man ex­tinc­tion. How much work/​in­vest­ment goes to­ward each topic, in to­tal. Peo­ple work­ing out­side the sci­en­tific com­mu­nity, in­clud­ing gov­ern­ments, prob­a­bly spend a lot more money and time on hu­man ex­tinc­tion than they do on dung bee­tles. How easy it is to get in­volved in hu­man ex­tinc­tion re­search com­pared to dung bee­tle re­search. The former could be a vast field with in­nu­mer­able open ques­tions, but it still seems difficult for most peo­ple to con­tribute in any re­li­able way; few of those open ques­tions are listed any­where, few classes teach these sub­jects, few re­li­able meth­ods ex­ist for mak­ing progress, etc. By con­trast, if you are a col­lege stu­dent and want to start study­ing dung bee­tles, you can grab some bug traps, fol­low your pro­fes­sors to a nearby na­tional park, and start tak­ing sam­ples. ...I sup­pose it’s time for me to start so­lic­it­ing lists of open ques­tions. That post will be linked here in about 15 min­utes. Please let me know if I missed any­thing, of course, from a more apt search term to a philo­soph­i­cal con­sid­er­a­tion. It would be nice to take the Dung Bee­tle Ques­tion from “open” to “closed”. This is great! I am gen­er­ally happy about peo­ple do­ing sim­ple fact-checks like this, in par­tic­u­lar on of­ten-quoted facts. What I am won­der­ing is, of dung bee­tles are a par­tic­u­larly hot re­search topic among an­i­mals/​in­sects. They are pretty cool, but would this graph look less ex­treme with some­thing like an­telope or sea urchin in there—or the av­er­age num­ber of re­search pa­pers on a par­tic­u­lar an­i­mal.